Get to know the staff of St. Mike's along with our Vicar & Chaplain. The Rev. Scott Claassen is the husband of Maribeth—a Certified Nurse Midwife and Women’s Health Nurse Practitioner—and father of Henry (5), Jimmy (3), and baby Amos. Scott is a fifth generation Californian who was raised in Monterey County but spent his high school years at Cate in Carpinteria. After studying Spanish Literature and Philosophy at Vanderbilt University in Nashville, Scott worked as a musician alongside artists ranging from Willie Nelson to the Nelly. A renewed call to ministry brought Scott to Yale Divinity School, where he investigated the relationship between religion and ecology. Those studies led to a Carbon Sabbath in which Scott spent one year without flying or driving. During that time, he cycled over 11,500 miles around the country while engaging Christian communities in dialogue about climate change. 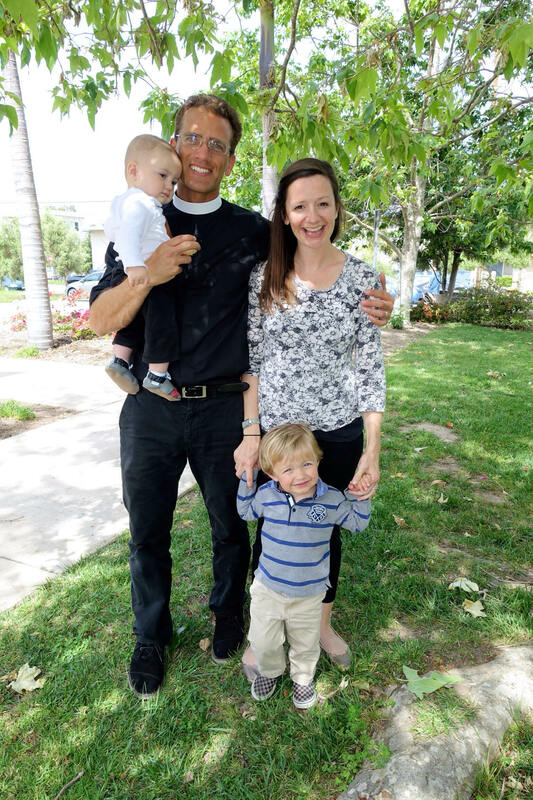 Prior to his arrival in Isla vista, Scott was the associate priest at an emergent Episcopal church in Santa Monica called Thad’s. He was ordained to the Episcopal diaconate during Thad’s monthly Laundry Love ministry and to the priesthood in 2014. Scott came to St. Mike's in the fall of 2015. When not working or with his family, Scott is usually surfing, exploring wilderness, playing music, or dreaming of new ways to make a love-spreading difference in the world. To read Scott’s blog about his Carbon Sabbath, click here: http://amovingstillness.cm/. To learn about Laundry Love, click here: http://laundrylove.org/. For info on Surfing and Spirituality, click HERE. For more on Scott’s music, go to iTunes, Spotify, or wherever you like to hear music. As a parish administrator and verger*, Casey oversees general administrative matters, building/grounds maintenance, and assists the vicar/chaplain in special projects and liturgies. As a campus missioner, Casey looks for opportunities to increase our engagement with students at UCSB. Casey and his wife, Amoni, came to St. Mike's in Fall 2016, but he joined the staff in Spring 2018. His brilliant young mind has helped St. Mike's grow and reimagine the possibilities for the present future. In his spare time, Casey enjoys reading, binging various television series with Amoni, and cruising around Isla Vista on his bike (often on his way to Spudnuts). OFFICE HOURS: Tuesday and Thursday 2-6pm and by appointment. *The office of verger has its root in the early days of the Anglican Church. Historically, vergers were responsible for the order and upkeep of the house of worship, including the care of the church buildings, its furnishings and sacred relics. Vergers also oversaw the areas of liturgy preparation, conduct of the laity and grave-digging! Today vergers can be found in cathedrals and other large-ish churches, but their role tends to be strictly liturgical and ceremonial. While Casey won't be digging any graves (! ), we hope that the title of verger helps to convey the breadth of his work/ministry portfolio at St. Mike's. I am a fourth year Italian Studies major, Comparative Literature minor, and I am returning as a second-year Cafe Picasso Intern. Food justice is important to me because I see homeless people in the streets asking for money because they are hungry, and at the same time I see food being wasted and thrown away. I believe something can be done to solve the hunger problem that continues to grow each year. However, it’s not just homeless people that are hungry: It is also families and students that have food insecurity problems. People don’t realize the severity of food insecurity that occurs in everyday life, but it is occurring and affecting people’s lives. I believe that it is our responsibility to look for solutions. When I am not working on my schoolwork or at Cafe P, I like to spend time with my friends, watch movies, go out to eat, cook, go swimming, play with my dog, listen to music, go exploring, and take naps! Visit me at Cafe Picasso on Sundays during the academic year, or send a message through the Cafe Picasso Facebook Page if you have questions about the program. I am a fourth-year Sociology major with a minor in Education, and I am returning for my second year as a Cafe Picasso Intern. Food Justice is important to me because everyone should have the right to fresh vegetables and fruits, regardless of race and economic status. As students, we struggle to make ends meet and find affordable produce and meals which is why I believe Cafe P is so important. This year I am which is why I am excited about my work at Cafe Picasso and the new opportunities to learn more about cooperation and growing our own vegetables through the St. Mike's Community Garden. When I am not working, I like to hang out with my roommates and try different food places, and now I am looking forward to destressing in the garden as well! I am a second year Sociology major at the University of California, Santa Barbara. Although I was born in Guadalajara Jalisco, Mexico I was raised in South Central Los Angeles, a community that influenced many of my interests including food justice. In my community, everywhere you turn, you come face to face with a fast food restaurant, up to three or four establishments to one street corner. Although there are grocery stores in our neighborhood, we do not have access to the freshest fruits and vegetables. Even when there are healthy options available they are often unaffordable. I have continued to connect how the inability to access healthy foods has affected our community’s overall health, and I am interested in learning how to help address this issue. My work in the St. Mike’s Community Garden gives me hands on experience in addressing these issues while working to increase access to fresh produce for students like myself. When I am not working at school or in the garden, I enjoy spending time with friends and family, reading, and catching up on sleep! Contact me if you have questions about the Garden, volunteering, or if you are looking to access some healthy produce! Marty grew up in the Midwest (St. Louis & Indianapolis) and graduated from Indiana University in Psychology with a Math minor. After graduating, she felt free to seek warmer climates and moved to Florida, then St. Lucia and St. Thomas. While in the islands, she enjoyed sailing, SCUBA diving and working various jobs. She moved to Santa Barbara to attend Brooks Institute and after the first year, realized it was time for serious work. She worked at the Coral Casino for 2 years which is where she started learning bookkeeping. After taking classes at night, she then went to work for a manufacturing firm. She worked over 20 years there, as bookkeeper, office manager and finally general manager. When the company was sold and relocated, she decided to pursue bookkeeping. She is happy to be part of the staff at St. Michael's. She enjoys swimming, biking and hiking in her free time. She lives in Goleta with her 2 cats and feels California is definitely home now. You may contact Marty at [email protected]. She generally keeps office hours on Tuesday afternoons, Wednesday mornings and by appointment. The Bishop's Advisory Committee (BAC) is a beloved group of parishioners who have been elected to help lead our congregation. Most Episcopal churches have a body known as a vestry. The basic responsibilities of the vestry are to help define and articulate the mission of the congregation, to support the church's mission by word and deed, to help select the rector, to ensure effective organization and planning, and to manage resources and finances. As a mission church, our Bishop's Advisory Committee (BAC) is comparable to a vestry. It is led by our vicar, and its members are nominated and elected each year at our annual meeting. The bishop's warden is the most senior member of the BAC besides the vicar and supports the vicar in their decision-making. The people's warden helps to support the congregation and is junior only to the bishop's warden and vicar on the BAC. the Standing Committee for Campus Ministry (SCCM) is made up of representatives from local congregations in our deanery who are interested in supporting the work we do a St. Mike's.